On January 9, 2007, Steve Jobs introduced the first version of the iPhone, which would grow to be the most popular mobile device in the world. The iPhone revolutionized the smartphone market and created the development of technology that combines three platforms: mobile phone capabilities, iPod capabilities on a larger screen, and internet capabilities that feel similar to a desktop experience. It was the mixture of these three platforms that made smartphones the global phenomenon they are today. Released in January of 2007, The iPhone 1st Generation was the brainchild of Steve Jobs. He first dreamed of a smaller version of the tablet without a keyboard and mouse, but after reviewing the prototype he re-imagined it as a smartphone. This 1st Gen iPhone sold over six million units as consumers camped outside Apple retailers. At the MacWorld Conference and Expo Steve Jobs proclaimed, “Apple will now reinvent the phone.” And so it did. Here is the full introduction of the original iPhone by Steve Jobs in 2007, complete with a detailed breakdown of all of the revolutionary features. Similar to the first iPhone, the iPhone 3G had a few improvements such as Assisted GPS, 3G Data, push email, and turn-by-turn navigation. It had one speaker instead of two but had a headphone jack and of course, the touch screen. The 3G sold over one million units its first weekend of release. In June of 2008, Apple introduced iPhone OS 2.0, bringing with it the now famous App Store. At the time there were 500 available apps for download, a mere fraction of what is available today. Here is the official introduction of the sophomore iPhone by Steve Jobs, with all of the details on what the 3G can do. The iPhone 3GS brought improvements over the 3G, including 24-bit color emulation and an oleophobic coating to help reduce fingerprints on the screen. It also came with an improved camera with auto focus, voice control, and a digital compass. Critics said the improvements were not compelling enough for users to turn in their current iPhone for the new one and that this was designed more for first-time iPhone users. Take a few minutes to relive the launch of the iPhone 3GS and enjoy the crowd gasping in unison when Apple Senior Vice President Phil Schiller firmly pronounces the “S” with force. And don’t forget that the “S” stands for “speed” according to Schiller. The iPhone 4 was released in June 2010 and touted as the thinnest smartphone in the world. It’s insulated stainless steel frame also acted as the antenna and the screen was made of a strengthened aluminosilicate glass. The iPhone 4 also introduced the game-changing new high resolution Retina Display. It received rave reviews by names such as Engadget and The Wall Street Journal, calling it the best device on the market.? After Apple Inc.’s senior VP, Phil Schiller, performed a mediocre job of launching the iPhone 3GS at the WWDC, Steve Jobs took the reigns back for the introduction to the iPhone 4. Here is the full video of the 2012 event. The iPhone 4s launched one day before the death of Steve Jobs, Apple’s founder and visionary. Perhaps this aided in the sales as over one million units sold on that first day. With an upgrade to the iOS7, it can act as a hotspot that lets a user connect a laptop to the internet using the phone as a wireless connection. Another great feature is the speech-to-text app, allowing the user to speak their texts while keeping their hands free. This time Apple Inc.’s senior Vice President, Phil Schiller, gives a much better introduction, and the iPhone 4S gets the launch that it deserves. This video details all of the improvements to Siri, and the tasks that she can now preform for you. The iPhone 5, which is actually the sixth generation iPhone, was released in September of 2012. This model featured major design changes from its predecessor. Some of these include an aluminum frame which is lighter and thinner than any of the previous models, and a taller screen. It also offers the user talk to text and voice commands for making restaurant reservations, getting sports stats, or posting Facebook updates. This was the first iPhone introduction by the newly crowned Apple Inc. CEO, Tim Cook. Most agree that he did a good job with the launch of the iPhone 5, however there was a certain level of solemness to the event due to the death of Steve Jobs. 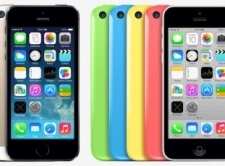 The iPhone 5c was released in September 2013 along with the iPhone 5s. Known as the “Inexpensive iPhone” it has much of the same hardware as the iPhone 5, just adding improved battery life. The operating system is the iOS 7, which acts as a media player and has a 4 inch screen with 640×1136 pixel resolution. The iPhone 5c also includes turn-by-turn navigation, which in some major markets includes a 3D view. Here is the launch video for the iPhone 5c that shows the creation of the beautiful colored cases that the 5c is known for. It also details all of the external case construction and the physics behind why it is so durable with the reinforced steel. The iPhone 5s was released the same day as the iPhone 5c, but including a more stylish look with a white case and gold border and a fingerprint scanner. This helped lay the foundation for future digital identification. The iPhone 5s also came with Apple EarPods that Apple said rivaled high intensity earphones that cost hundreds more. This is one of the coolest iPhone launches yet, with a full presentation from the guys at Epic Games, and a demonstration of the video game “Infinity Blade”. Phil Schiller then breaks down the benefits of the new Apple A7 chip and provides numerous examples as to why it is the most powerful smartphone chip yet. Introduced in September of 2014, the iPhone 6 brought a bigger display with improved graphics, LTE and Wi-Fi, and storage capacities. The battery did not seem to have improvements, nor did it come with the optical image stabilization that its companion, the iPhone 6 Plus does. It was also the first smartphone from Apple to introduce Apple Pay, hailed as the revolution of the digital wallet. Finally Apple Inc. gave the world what it was asking for and launched the iPhone 6 and iPhone 6 Plus, which had a large 5.5 inch screen. Then the guys from Super Evil Megacorp come by to demo the video game “Vain Glory” for the new Apple device. Phil Schiller then explains why the new Apple A8 chip is the greatest smartphone chip ever made. Coining the term “phablet”, the iPhone 6 Plus brought in a larger screen that measured 5.5 inches diagonally. Launched with the iPhone 6, the 6 Plus seemed to get all of the initial attention. It appeared to have a better battery life than even the iPhone 6 and made many apps seem like they are presented on a tablet or even desktop. It might be a bit of a handful for one-hand use, but it does have the option to slide the screen down with Reachability. Here is the official Apple Trailer for the iPhone 6 and iPhone 6 plus that details all of the new features and capabilities. The video also goes through the measurements and improvements to the camera and the retina display.